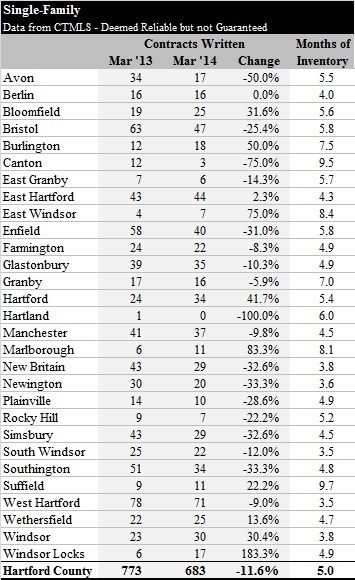 The Hartford County single-family market ended the first quarter with about 5% less activity than observed in the first three months of 2013. 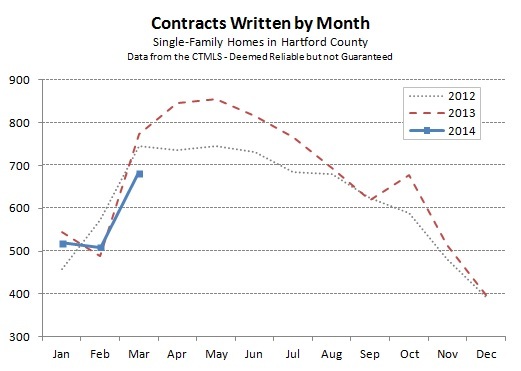 March of this year resulted in more than 11% fewer single-family contracts than March of last year. The market has continued to feel slow as we gradually transition from winter into spring. The inventory of available homes is currently at 5.0 months, which is higher than the 4.6 months observed at this point last year. The total number of single-family homes listed during the first quarter of the year is more than 8% higher in 2014 than in 2013. There are nearly 14% more active listings right now than there were at this point last year. These statistics undermine the argument that the County is behind trend for the number of deals because inventory is too low. Clearly there are homes on the market for buyers to consider … so what’s different about this year? We don’t know for sure. Maybe buyers just aren’t ready to pull the trigger on a home. Or maybe the homes that are available are in different towns and/or at different prices than the buyers want. Or maybe it really is the cold weather. We should learn a lot more about the spring real estate market in April.